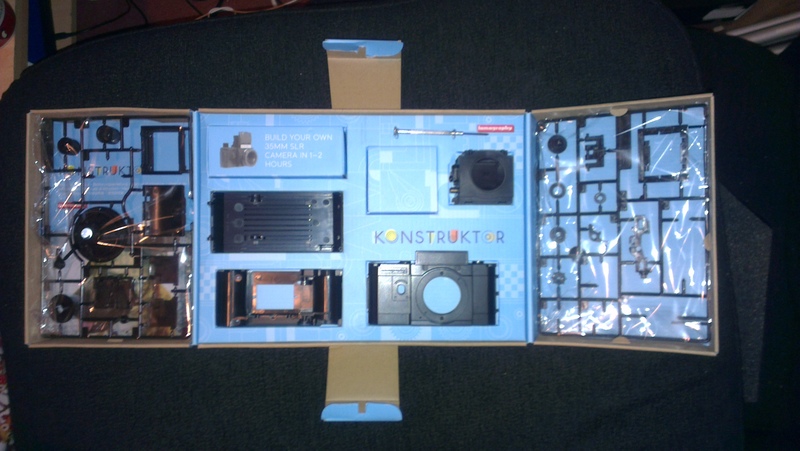 I was lucky enough to be given the lomography Konstruktor DIY SLR camera kit. 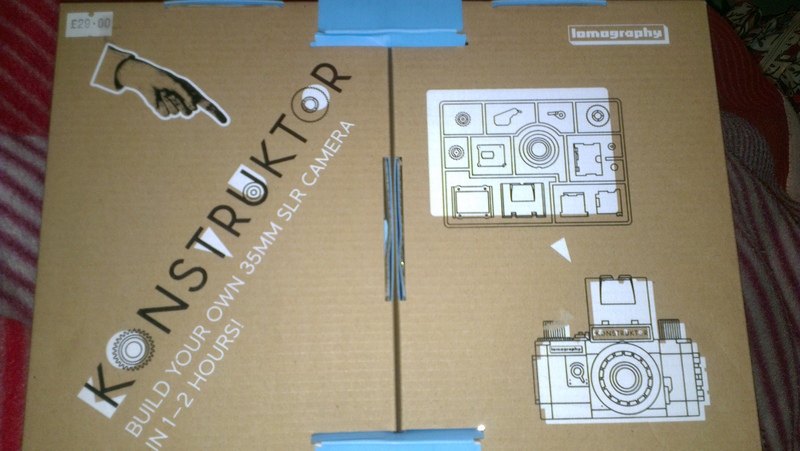 I had been interested in this kit for a while, I thought it would be fun to build my own camera and learn a bit more about how cameras work in the process. Lomography said that the camera was simple to build and would take 1-2 hours to complete. Well, I built it yesterday and I did feel a sense of achievement upon completion but only because the previous 4 hours (!!) were like a living nightmare (apart from the very nice curry I had for tea halfway through). 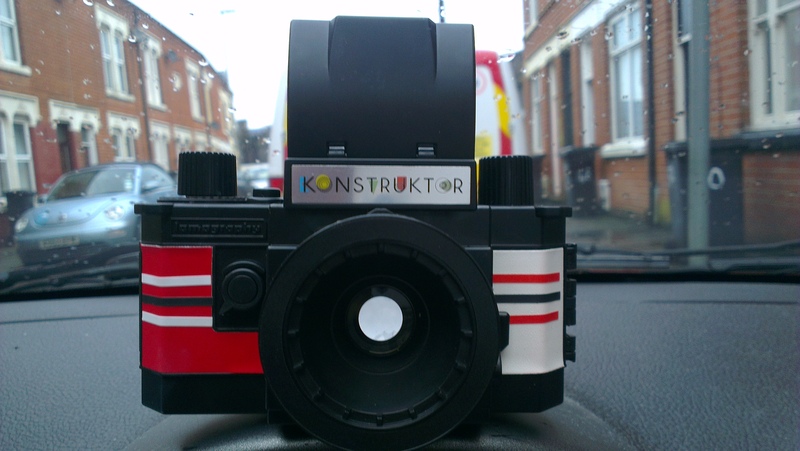 I have documented my journey with the Konstruktor via the medium of blurry mobile phone camera pictures. It looked straight forward. 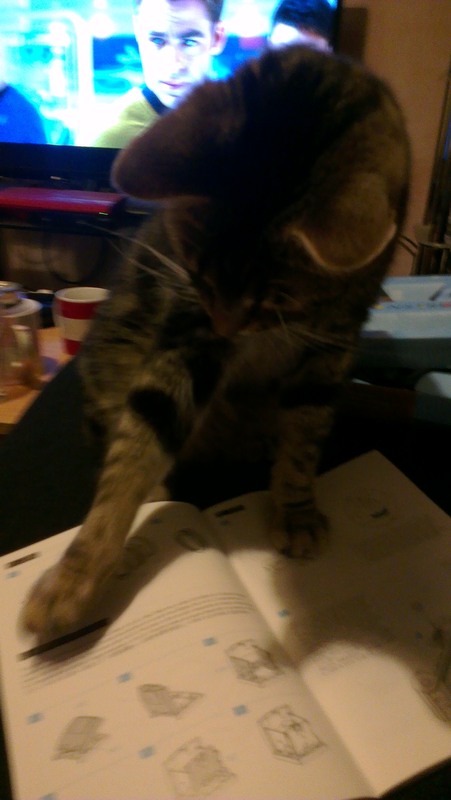 I can follow instructions and am reasonably bright, how difficult could it be? The instructions were alright but at times I had to consult the internet for further clarification on how bits joined together. There were so many tiny tiny tiny screws that all looked a bit the same, and I had to screw them into all kinds of hard to reach areas on the camera and they never seemed to want to go in straight, they just wanted to stick to the magnetised screwdriver! Here is a tip for anyone making this camera: two types of screws look v. similar but one has a mushroom cap and the other a flat cap- for your own sanity separate them at the start! 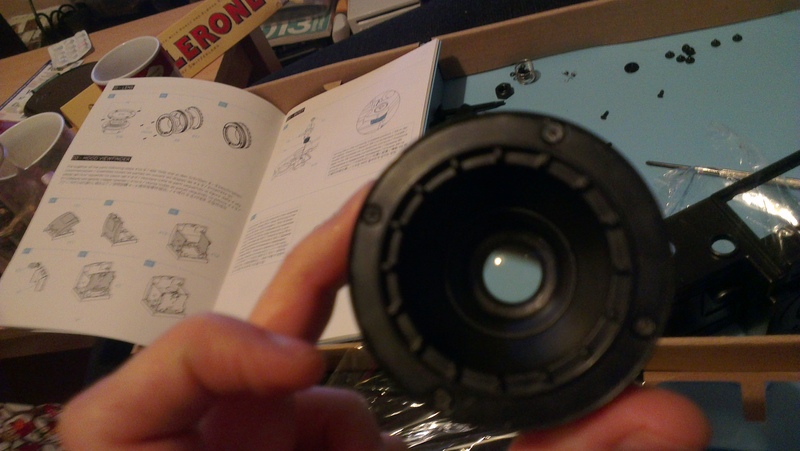 There is a guide to all the parts, including the screws at the very BACK of the manual, I didn’t find this until the end…..
At times there were issues with bits that were meant to fit together not quite fitting and having to force them, this was particularly true when assembling the lens. Some parts were meant to twist together until the screw holes were aligned, however, mine always seemed to be about 2mm out. I managed to do it eventually but it took a while and it wasn’t enjoyable! There was a particularly dark moment which involved hooking a tiny spring over a tiny pole without stretching and deforming it- I’m still not ready to talk about it. The viewfinder is bewitching to look at, so different to the optical viewfinders of most SLRs and having to look at 90 degrees to the image is an interesting experience. The mirror mechanism makes a satisfying clunk which reassures me that things are working as they should! However, after all this pain the camera doesn’t work properly, the film keeps jamming. The film spool rotates beautifully without film on and loads perfectly but after 1 or 2 shots everything just jams up and it it won’t turn. This is apparently a common issue with this camera but it is kind of heartbreaking after all of this effort for it to still not be functional! I have looked up a couple of fixes, the first I will try is to use 24 exp film rather than 36 exp as some users on flickr state that this has made a difference in their model. If that sill fails I will open it all up again and remove the film counter cog. I hope it works soon! This entry was posted in Uncategorized and tagged DIY, film photography, konstruktor, lomography, photography, review, SLR. Bookmark the permalink. Thanks so much for putting this little review together. I am considering getting one myself. 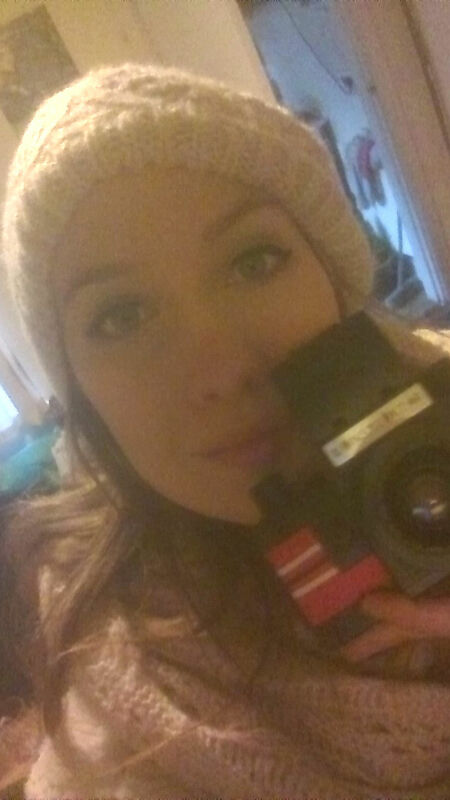 It looks to be an interesting camera and everybody loves a challenge! Thanks, your post inspired me to actually start making the thing! 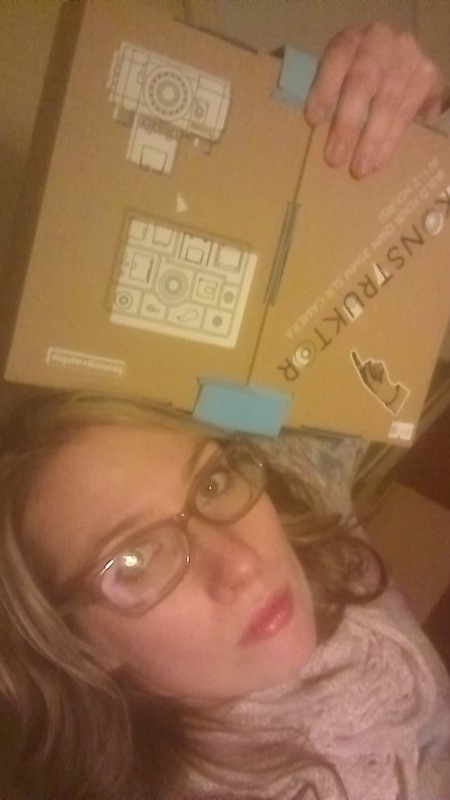 Sorry to hear the konstruktor was such a pain for you to put together. I had very little trouble with mine (luckily) and it’s a joy to shoot. Looking forward to seeing your shots with it. Cheers! Sorry you had such problems. Weirdly it almost makes me want to try one for myself as a kind of challenge! Anyway sounds like you’re *sort of* having fun trying to get it to work. I did enjoy it in a strange way. It was satisfying when I finished each step but there were times when I wanted to throw it on the floor and have a tantrum! hi! I’m having the exact same problem with the lens! I can’t seem to get it to fit the screw holes, how did you do it in the end? it’s so frustrating! This probably isn’t what you want to hear but I just sat there for about an hour taking it apart then twisting it back together, then eventually it worked! I probably wore something down. I kept checking whether the front hole lined up with the hole under infinity focus point. Good luck, you will defeat the Konstruktor! Thank you for the reply! but I’m back at work 😦 so I can’t continue with it! Hopefully i’ll defeat it soon! Just keep at it, I know it’s frustrating but you have to get your money’s worth. I am back at work this week too, feeling like I need another holiday ASAP! Interesting – thanks for the lomo/ladygrey film tip – probably the only reason you had as little trouble as you did here is due to your quality helper…I have five that are always up for helping me.